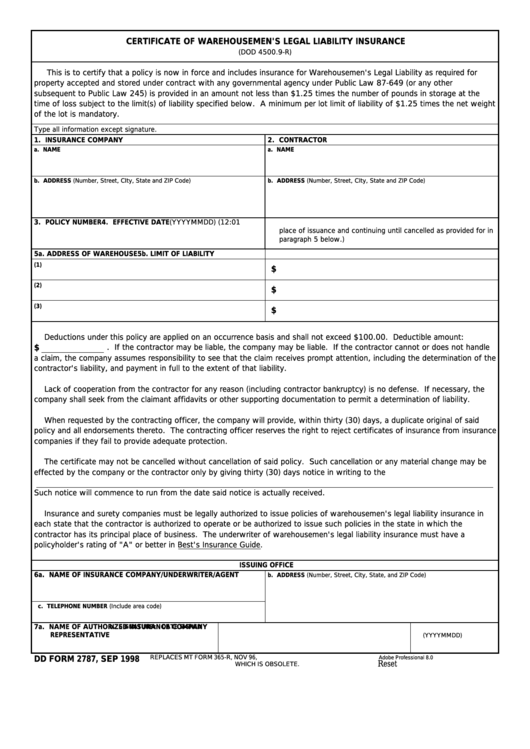 Download a blank fillable Dd Form 2787 - Certificate Of Warehousemen'S Legal Liability Insurance in PDF format just by clicking the "DOWNLOAD PDF" button. Complete Dd Form 2787 - Certificate Of Warehousemen'S Legal Liability Insurance with your personal data - all interactive fields are highlighted in places where you should type, access drop-down lists or select multiple-choice options. of the lot is mandatory. Type all information except signature. contractor's liability, and payment in full to the extent of that liability. company shall seek from the claimant affidavits or other supporting documentation to permit a determination of liability. companies if they fail to provide adequate protection. Such notice will commence to run from the date said notice is actually received. policyholder's rating of "A" or better in Best's Insurance Guide.